Sign in to your Google account as an administrator. Create a dedicated user who can manage calendar resources. See the Google support article Add users individually for instructions on how to add this user. Create or locate a calendar resource for each Zoom Room. See the Google support article Add a calendar resource for instructions. Make sure that you can see the calendar resource for each room under My calendars. Follow these step to share a calendar resource with your users. Repeat these steps for each calendar resource you want to share. 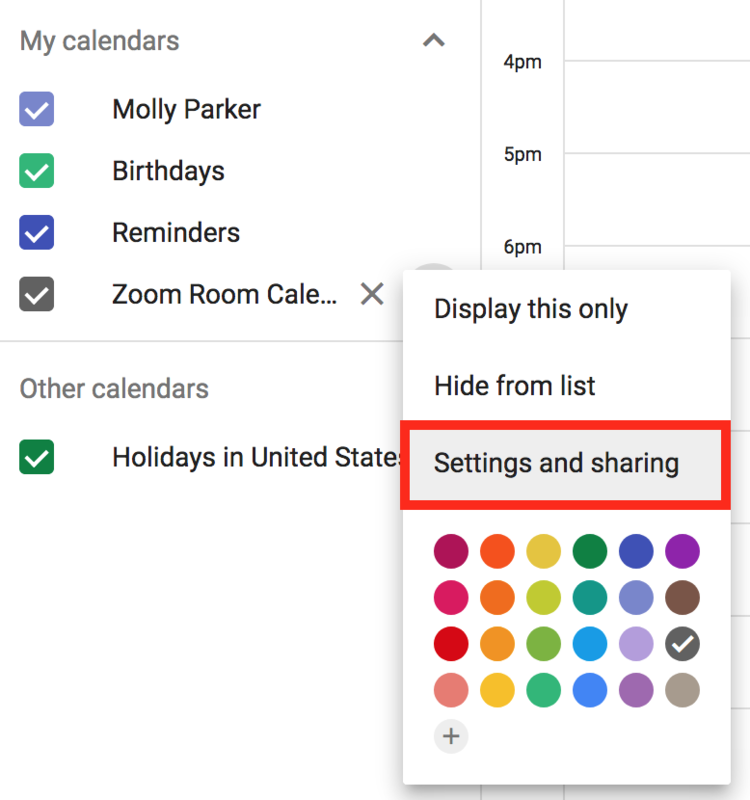 Navigate to a calendar resource for a Zoom Room, then click the ... to the right of the name and choose Settings and sharing. 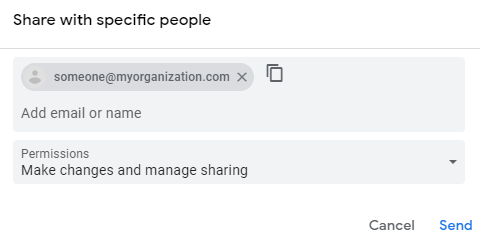 Below Share with specific people, click Add People. For Permissions, choose Make Changes and manage Sharing. After sharing a calendar resource with your users. 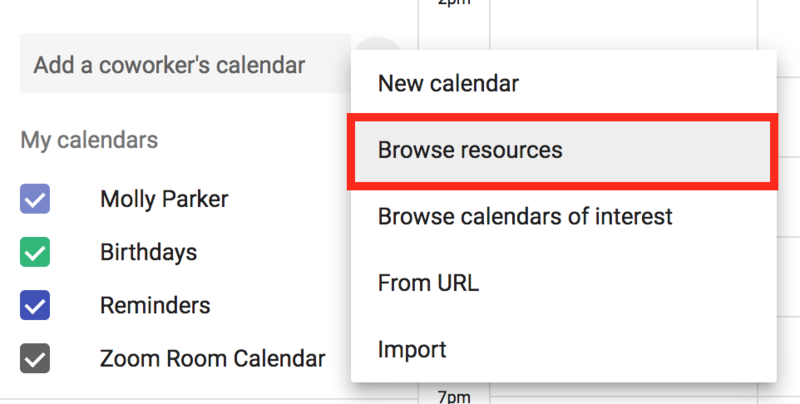 You can instruct your users to follow these steps to add the resource so that it displays on their Google Calendar. Sign in to your Google account as the dedicated user who can manage calendar resources and open the Calendar app. Subscribe to all of the calendar resources that are available for Zoom Rooms:Next to Add Coworker's Calendar, click +, then Browse resources. Browse the resources and check the box next to the Zoom Room resources. 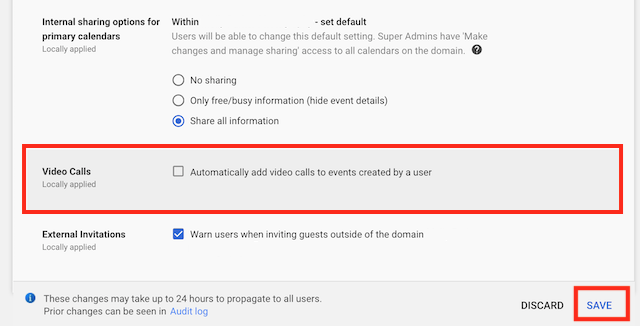 Log in to Google Admin and navigate to Calendar - Sharing Settings. Sign in to the Zoom web portal with your Zoom credentials. Note that these credentials must have the Zoom Rooms privilege. Under Room Management, choose Calendar Integration. Click Add in the Google Calendar section. Choose the email address associated with the shared calendar service for your organization. If the dedicated user for the calendar service is not shown, click Use another account, and add the credentials for that user. Click Allow on the confirmation page that gives Zoom permission to manage the calendars in the dedicated user’s account. The Calendar Service page shows the calendar resource that you added.